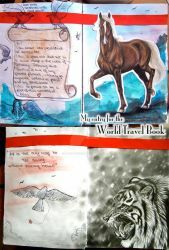 I want to create a book that travels around the world, from one deviant to an other. Each deviant can add his part to the book, a drawing, poem, a little story, photos, etc. I want to reach every corner of the world with this book, to see how wide our network reaches, to let other people see how wide we are connected, to let them be able to touch, to hold the proof in their hands. And when it is full, I want to hold it in my hands again and make my own imaginary world travel with it. Join this group and enter a world of endless wonder. So, the book is in the making, who wants to participate in the journey? Everybody from all over the world is welcome, the more the merrier. the book will be sent from one deviant to the other and will grow with each deviant who passes it to the next. Just comment. It will be a lot of fun! You have no idea how happy it makes me to see so many people still interested in this project! Especially since I've started it 4 years (!!!) ago! 1. Talty Mexico has the book? (It can still change, but I hope it will stay like this). Plus I am sure there will be more people participating than who are on the list now. I will send off the books during the next week. Dec 23, 2013 Merry Christmas! We are 370 travelers from 62 countries. The books have reached 5 countries (Germany, England, Ireland, Canada and the USA) so far. 3rd book: 8 entries, in Germany at the moment, 1 country LOST?! is the book still travelling? Hi, I just remembered your book and had to look up how it is going! Still adore the idea and wonder if you ever got the books back? I was in the second book! Got asked to be featured in this like, 3 years ago now but still very much interested if the England one is still floating about. Hopefully something comes of it, really good idea still just a shame some people are a let down. JUst need your address (if you haven't sent it already) and you are noted down for this book. BUt the ENgland one is, as I said in both last journal entries, missing in action. You can send that girl a message about being let down, I did all I could. Sadly not as much as I would like it to be. I have the Steampunk book at my home right now, but all the others have gone missing - or I know where they are but the persons don't answer anymore. But once I wrote my exam on Thursday I will try to get this whole thing going again. Oh, I see... well, do you need a new notebook?